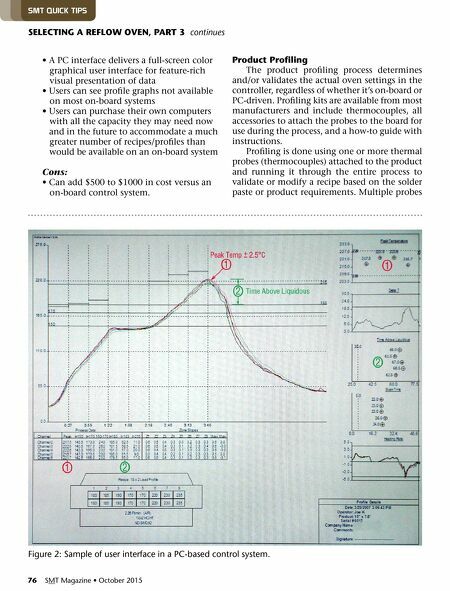 October 2015 • SMT Magazine 77 are desirable for profiling to ensure that the board surface temperatures from one side to the other don't vary more than 2–4°C. An optimal reflow profile is one of the most critical factors in achieving quality solder joints on a PCB assembly with surface mount compo- nents. A profile is a function of temperatures ap- plied to the assembly over time. When graphed, a curve is formed that represents the tempera- ture at a specific point on the PCB, at any given time, throughout the reflow process. on-board Profiling Profiling can be done with some on-board control systems; however, they are limited in vi- sual representation by size and configuration of the display, and they usually don't have a utility to print or save and retrieve a file off-line, which is necessary for ISO 9000 and other quality as- surance documentation. So if you are consider- ing an on-board control, make sure it has the option available to export/output data for QA documentation if you think you will ever need it in the future. 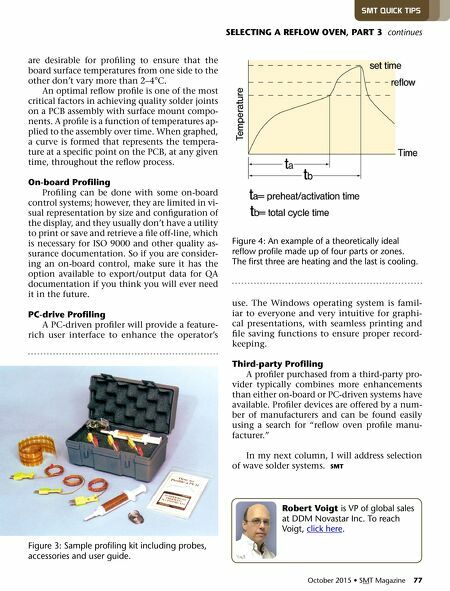 Pc-drive Profiling A PC-driven profiler will provide a feature- rich user interface to enhance the operator's use. The Windows operating system is famil- iar to everyone and very intuitive for graphi- cal presentations, with seamless printing and file saving functions to ensure proper record- keeping. third-party Profiling A profiler purchased from a third-party pro- vider typically combines more enhancements than either on-board or PC-driven systems have available. Profiler devices are offered by a num- ber of manufacturers and can be found easily using a search for "reflow oven profile manu- facturer." In my next column, I will address selection of wave solder systems. SMt robert Voigt is vp of global sales at DDM novastar inc. To reach voigt, click here. sMT quiCk TiPs SeLectInG A reFLoW oVen, PArt 3 continues Figure 3: Sample profiling kit including probes, accessories and user guide. figure 4: an example of a theoretically ideal reflow profile made up of four parts or zones. The first three are heating and the last is cooling.